Watlow provides over 85 years of manufacturing, research and product development for your temperature sensing needs. Watlow manufacturers a tremendous selection of general application, mineral insulated metal sheathed, base metal, high temperature, surface temperature and multipoint thermocouples are available. Fiberglass insulated thermocouples are capable of temperatures up to 900°F (480°C) for continuous operation. Watlow provides grounded, ungrounded and exposed junctions. Watlow uses a verification process at selected temperature points to products conform to ASTM error limits. 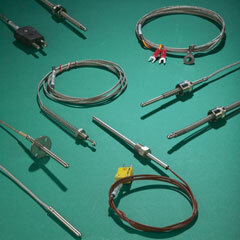 Same day delivery on millions of thermocouple configurations is available.